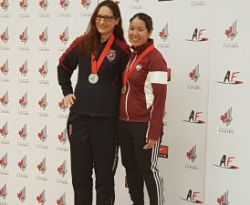 Comments Off on 2019 NB Provincial Championships / Championnats provinciaux 2019 du N.-B. Hello FENB Members, We are pleased to announce the 2019 KV Open tournament on February 23-24, 2019. The flyer with all of the information is here. ************************************ Cher membres du FENB, Nous sommes heureux d’annoncer le tournoi de KV Open les 23 – 24 fevrier. Le flyer avec toutes les informations est ici. Hello FENB Members, Registration is now open for memberships for the 2018-2019 season. You can register here, and don’t forget that membership is required for taking part in any FENB activities including club practices, training camps, and tournaments! Anyone who has trouble with registering should contact the FENB Executive Director (fencingnb@gmail.com) for assistance.